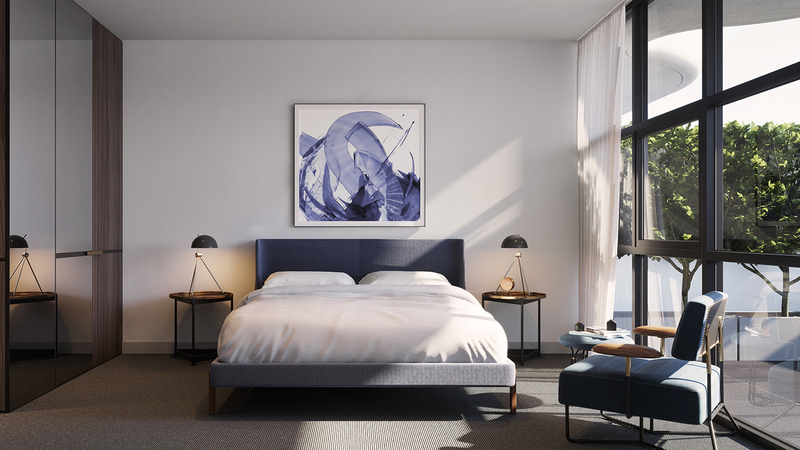 The sweeping, sculptured form that is NOCO holds within it just forty stellar apartments that bring the epitome of modern luxury living to the heart of Northcote. NOCO apartments are laid spaciously over four levels, with one, two and three bedroom options available to buy now. Each apartment has been crafted with a tailored and focused approach, resulting in 31 bespoke floor plans to choose from. As an early buyer, you will be able to take full advantage of the wide selection of properties and find a NOCO apartment that is distinctly you. Kyriacou Architects have channeled their artistic efforts into creating an iconic landmark address with elegant curves and Art Deco accents. 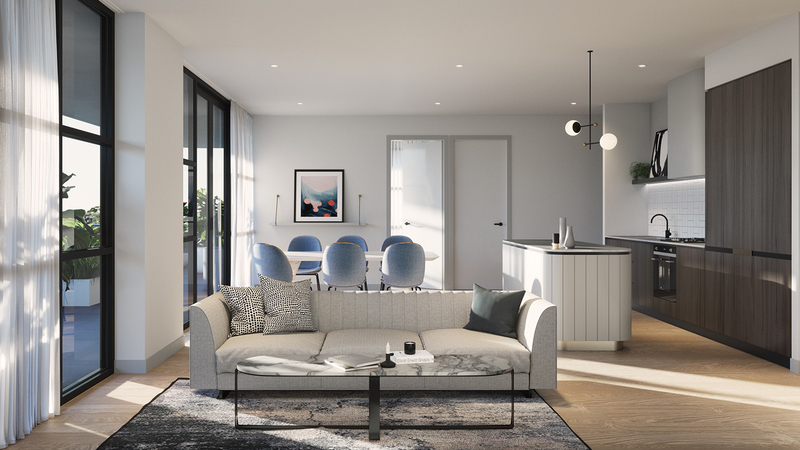 The result is a design that showcases innovation and style while exuding a timeless elegance that encapsulates and complements the urban fabric of Northcote. The design narrative of NOCO’s exterior is extended inside the apartments, where bespoke joinery echoes the façade’s sweeping curves. Composed by Mim Design Studios, the interiors are a harmonious joining of materials and features that are visually in tune with each other. The soft contours and pale palette drawn into each home are brought to life through timber floors and gently lit white walls, all contrasted with striking black window frames that punctuate the interior aesthetic. The expansive balcony that each NOCO living space opens out onto embodies the alfresco element of living that breathes life and freshness into the everyday. Delivering breathtaking, uninterrupted views, these spacious areas are the ideal place for gathering with friends and family with a gorgeous backdrop. 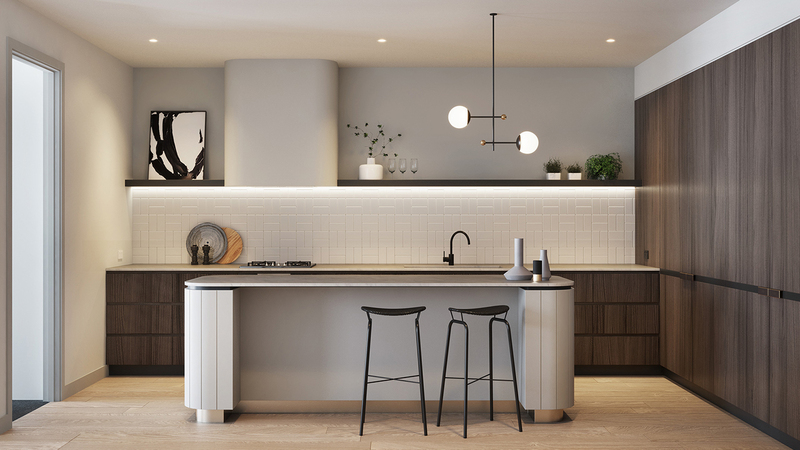 The kitchen is fitted with quality fixtures and fittings including European appliances, stone benchtops, beautiful timber-look cupboards and designer lighting inclusions. The result is a well-considered design that successfully delivers functionality and luxury. The benefits of living at NOCO don’t stop at your indulgently comfortable apartment. Residents will have access to bike storage, personal storage cages, and undercover car parking. Another considered inclusion is the gourmet grocer with organic produce and fine food positioned conveniently on the ground floor of the development. NOCO celebrates the character of Northcote – a suburb known for its unique blend of lively cafés, restaurants, and bars, nestled between designer boutiques, galleries, and pubs. The best of Northcote’s contemporary foodie scene can be found in The Herbert with their Padre coffee, The Breakfast Club on St Georges Road, and CERES – Northcote’s local community garden and produce market for fresh food. Northcote is interwoven with waterways and open green spaces. Just minutes from NOCO lies Merri Creek Trail, winding upstream through CERES Community Environment Park and downstream to meet the Yarra River and Yarra Bend Park – inner Melbourne’s largest area of natural bushland. Positioned just 6km from the CBD, this is a place of authentic and abundant charm that’s never too far from the city. In fact, hop on the 11 tram right on your doorstep and you’ll be connected to the CBD in under 20 minutes. NOCO apartments are expected to be complete by mid-2019 and the display suite is now open. 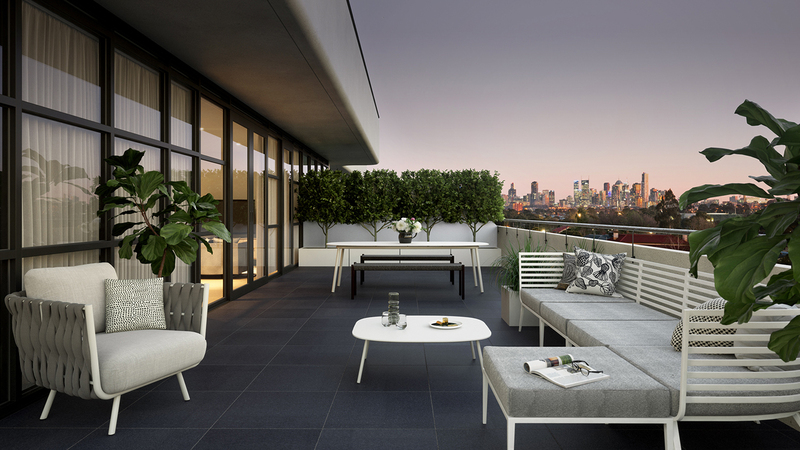 One bedroom apartments with a study start from $435,000. For more information or to enquire about NOCO, click here. Find more apartments in Victoria here.